Republican Senator Susan Collins went to the Maine Medical Center Research Institute to get a tour of the lab. She ended up receiving a standing ovation for her stance on health care. "It certainly is a difficult time in Washington, but I have never shied away from a challenge, and I’m not exactly a shrinking violet," she said. The moderate Republican has opposed efforts to repeal the Affordable Care Act without a replacement. She has also stood in the way of a Senate Republican plan to reform health care, that she worries will bring devastating cuts to Medicaid. 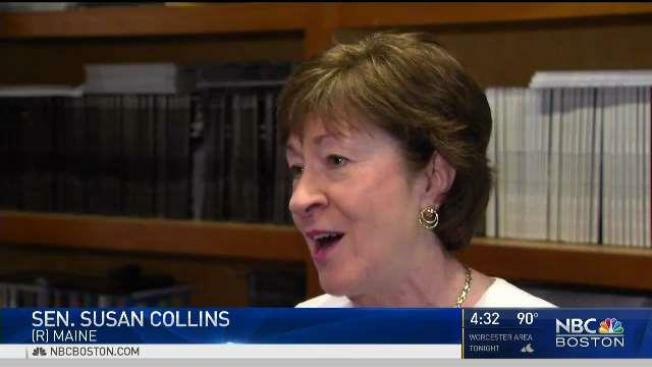 Senator Collins said she expects to have a health care vote next week – but she isn’t sure if it will be a revised Republican health care bill, or a measure to repeal Obamacare without a replacement. "I don’t think either approach is a viable option," Sen. Collins said. She is urging Senate leaders to have hearings and work with Democrats on a compromise. Collins has become a Senator to watch – not only for her votes on health care, but also for her role on the Senate Intelligence Committee. As her committee works to investigate Russian interference in the election, she is concerned about reports that President Trump’s attorneys are trying to undercut special counsel Robert Mueller. "[Mueller] cannot be interfered with," said Collins. "I think it would be catastrophic if the President were to fire him. What the President really ought to do is just not say another word about the investigation, and just let it go forward."